^ a b Harris, JB; LaRocque, RC; Qadri, F; Ryan, ET; Calderwood, SB (30 June 2012). 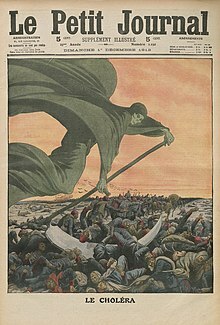 “Cholera.”. Lancet 379 (9835): 2466–76. doi:10.1016/s0140-6736(12)60436-x. PMC 3761070. PMID 22748592. https://www.ncbi.nlm.nih.gov/pmc/articles/PMC3761070/. ^ GBD 2015 Mortality and Causes of Death, Collaborators. (8 October 2016). “Global, regional, and national life expectancy, all-cause mortality, and cause-specific mortality for 249 causes of death, 1980–2015: a systematic analysis for the Global Burden of Disease Study 2015.”. Lancet 388 (10053): 1459–1544. doi:10.1016/s0140-6736(16)31012-1. PMC 5388903. PMID 27733281. https://www.ncbi.nlm.nih.gov/pmc/articles/PMC5388903/.